I think most people think of Chinese dim sum when they think of siu mai. Vietnamese xiu mai, however, simply means meatballs. There are many versions of xiu mai from rather sauceless meatballs with a few carrots and peas to xiu mai in a light tomato sauce. I recalled my mom's braised meatballs with lots of meaty juices. So yummy that I'd dunk the bread to sop up the juices. You could also eat these with rice and spoon the sauce over the rice. These freeze really well. And if you spoon some of the juices into your freezer bag, they'll retain their juiciness upon reheating. If you're too lazy to make your own sauce, or are afraid of caramelizing the sugar, here's my quickie bottled sauce recommendation. Add 2 tblsp fish sauce, 1 tblsp soy sauce, 2 tblsp sugar, 1 tsp ground black pepper, 1/2 tsp salt, 3 minced cloves of garlic, and 1 small chopped onion to 1 lb of ground pork. 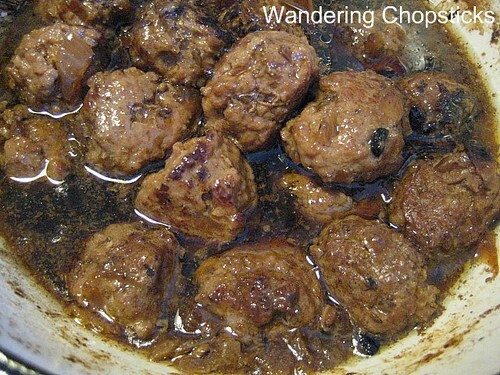 Shape pork into 2-inch-sized meatballs and pan-fry on high heat until charred. Don't worry about fully cooking them as they'll simmer in the sauce later. The pan-frying helps them retain their shape when they later get braised. When the meatballs are golden, scoop them out into a separate bowl and set aside. In the empty sauce pan (It's OK if there's browned bits and some fat, that's for flavor. ), make the Nuoc Mau (Vietnamese Caramel Sauce). Stir and when the sugar caramelizes and turns brown, add another 1 cup of water. Stir the caramel sauce again and add the meatballs back in. Let simmer, uncovered, on medium-low heat for about half an hour to fully cook the meatballs and let the sauce reduce. These meatballs are meant to be soft and tender so it's perfectly acceptable to squish them inside your sandwich. You can also squish them and spread them out like a Pate (Faux Gras with Chicken Livers) and add other meats. Eat with rice, make Banh Mi Xiu Mai (Vietnamese Meatball Sandwich), or Bo "Ne" Bit Tet (Vietnamese "Stand Back" Beef Steak). Who made my recipe for xiu mai? 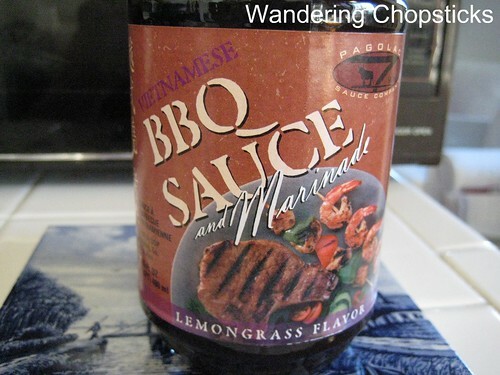 David of Houston Wok declared this is one of his "favorite recipes of all time." 1 year ago today, Happy Bakery in Alhambra burned down. :( They've cleared but haven't rebuilt that space yet. And the herbal medicine shop, Dai Xuong (Tai Shang Hong) opened up a few doors down from their previous location at the same strip mall. All of your recent Banh Mi posts have made me painfully aware of the fact that I've never had one. I plan to rectify this situation soon! I was just talking to my daughter today about these sandwiches. 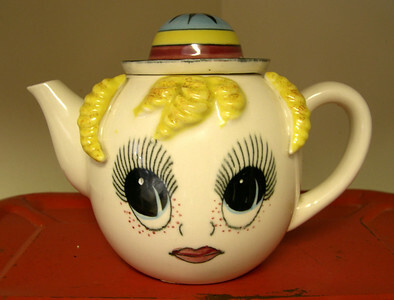 I have to make one! I salivated when I saw the finished sandwich. 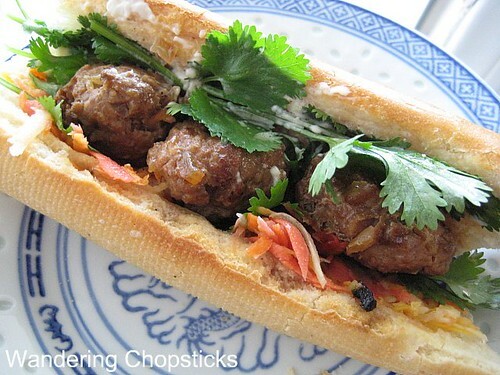 Just had a couple of good meatball banh mi "outside" (restaurants) and we've been wanting to make some. Hi WC - Looks great.....so many Banh Mi places put some kind of weak tomato based sauce on their Xiu Mai....it just ruins the flavor for me. I can't believe you've never had a banh mi! Guess there aren't too many opportunities on that road trip. I think mine are much better. Seems like all the other types of meatballs are in a weird sweet tomato sauce. I agree. I generally don't like banh mi shop xiu mai. Not very flavorful. Thank you so much for this recipe! I've been wanting to try replicating the xiu mai sandwich from my favourite sandwich place in Vancouver and this gives me a start. I think my recipe is much better than what you find in any sandwich shop. Really! I'm sure it's roots are Chinese, but it's interesting to see how the definition changed with Vietnam and Indonesia. Still meatball though right? this is xiu mai?? i dont think i've ever had these! or seen them for that matter. think i will try some next time i have banh mi! I think I still have a few meatballs in my freezer you can have. The ones from the stores don't taste as good as mine! I was wondering if the xiu mai can be braised with coco rico coconut juice instead of the water? Or would that make the meat too sweat considering we are already caramelizing sugar and water? Sure, why not? The meat will be sweeter, like thit kho, but I bet it'd taste great too. How much Nuoc Mau is needed in your recipe? The portion is listed in the nuoc mau recipe, but I'd say a tblsp or so should suffice. Adjust to suit your tastes. Thank you for sharing your recipe - looks and sounds delicious! Do you freeze these cooked or raw?